If you look at the path of Hurricane Irene, it cuts a good wide path through many of the areas served by the Journal Register Company, owner of The Reporter. These sites are located in eastern Pennsylvania, New York, New Jersey and Connecticut (other operations in Michigan and Ohio will likely be spared from this storm). The digital and print operations of all these sites depends on a vast network of computers, servers and Internet connections that keep them all working together. And of course the print operations rely a highly co-ordinated system of delivery to get hundreds of thousands of newspapers to reader driveways and local stores each morning. So with what could be a record-breaking storm looming to our south, planning to keep the web sites humming and the presses rolling has been underway for several days. Sites with generators will host journalists and editors from other sites; alternate print sites have been lined up should one of the presses be incapacitated; alternate and cellular networks are ready to handle the data for both print and online. 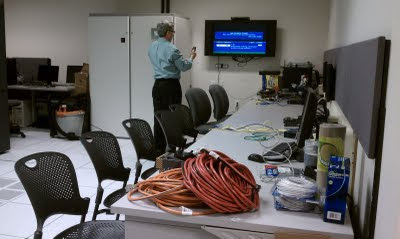 In Yardley, PA, corporate headquarters for JRC, a temporary newsroom has been set up in a computer server room is ready to host reporters, copy editors and layout editors from nearby Trenton. 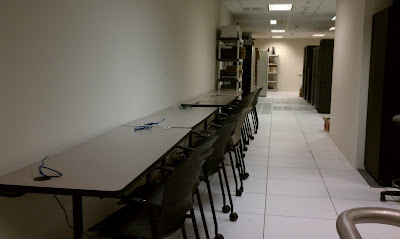 This space has a generator to power not only the computers and network machines, but the lights and air conditioning as well. 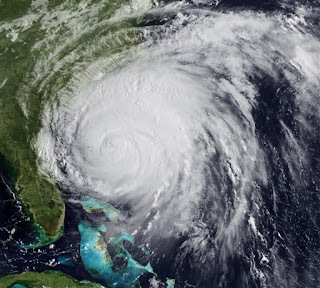 We don't know exactly what damage Irene is about to unleash on us, but at least our journalists will be able to keep the readers, both on the web and online, informed and updated without a break.